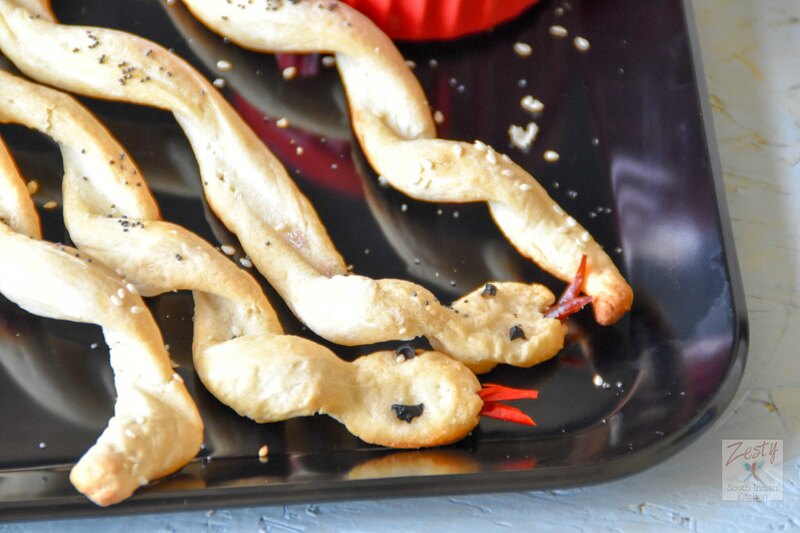 Happy Halloween, delicious bread stick snakes excellent idea for your party table. Today is Halloween, my kids are excited too much to celebrate Halloween, they were already planning for which costumes they are going to wear for months. How to decorate their little pumpkin? This year they got two days to wear their Halloween costumes. Yesterday in our neighborhood there was a Halloween party, it was a small gathering with food, fun and games. My kids thoroughly enjoyed as they played lots of games and my son even enjoyed dancing. 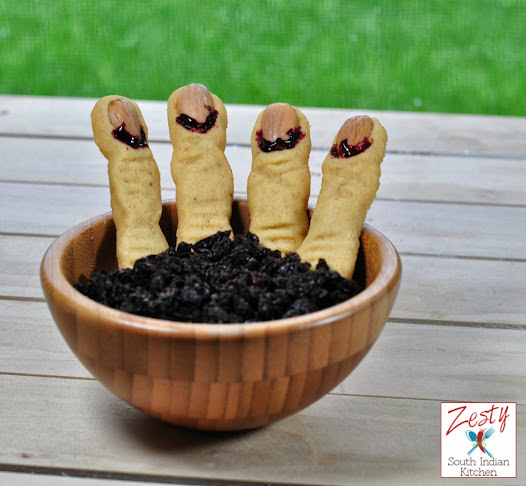 Because of their enthusiasm towards Halloween I too started making treats. This “Bread Stick Snakes” is one of them. I made chocolate Fig mice too. 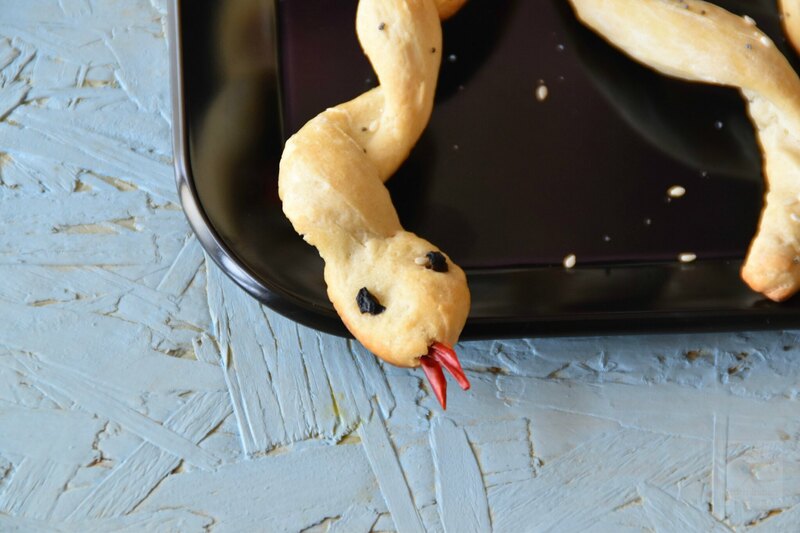 I tried this Bread sticks snake from Country living magazine. I tried twice, the first time using homemade pizza dough. I was thinking it will be similar to bread stick bone using homemade dough which I had made earlier. I think I did too much curling and resulted in snakes that were too curly. And they turned out to be snakes that are bulky looking and getting too much to eat. So decide to make it the second time using store-bought pizza dough as original recipe said. 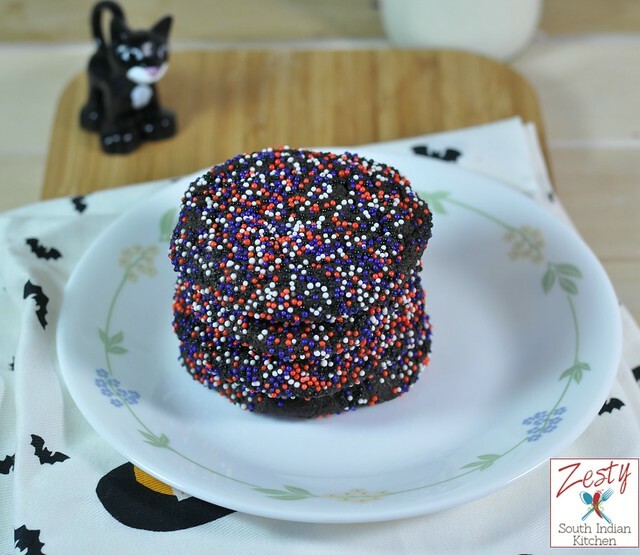 I would love to make simple treats for kids without loaded sugar as they are getting a sugar overload with candy which they collect during trick-o-treat. My kids like bread sticks especially those we get from Pizza Hut, so bread sticks are safe bet so decide to try them. I like to serve them with marinara sauce instead of soup. Because my daughter likes to dip in marinara and then eat it, she told me mama I am going to eat tail of the snake and then head. It was really funny. It is really simple to make, first cut the refrigerated pizza dough into 2 inch slices of 12 pieces and then try to roll them onto chop stick, make sure to make less twist otherwise your snake will too curly that is what I learned from my mistakes. Also baking time is different from the recipe so watch for your oven as they are different. 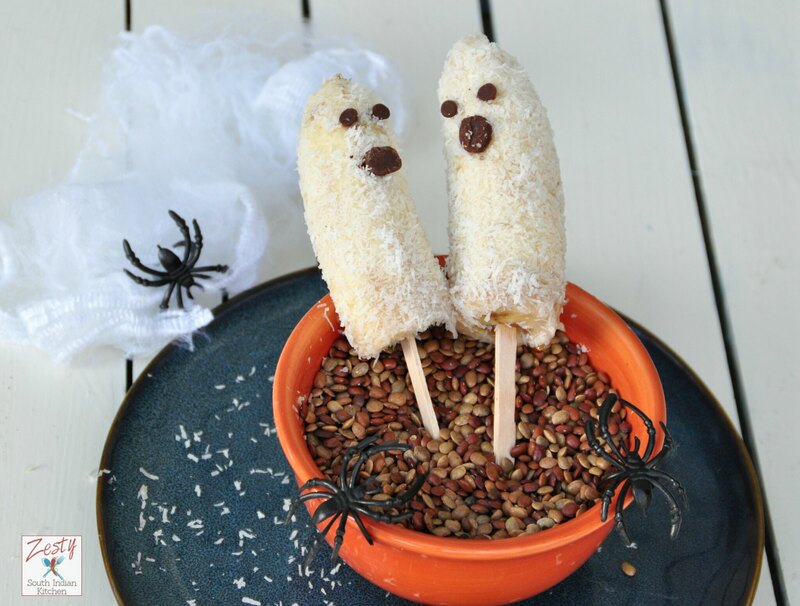 Kids will enjoy these spooky cute treat. 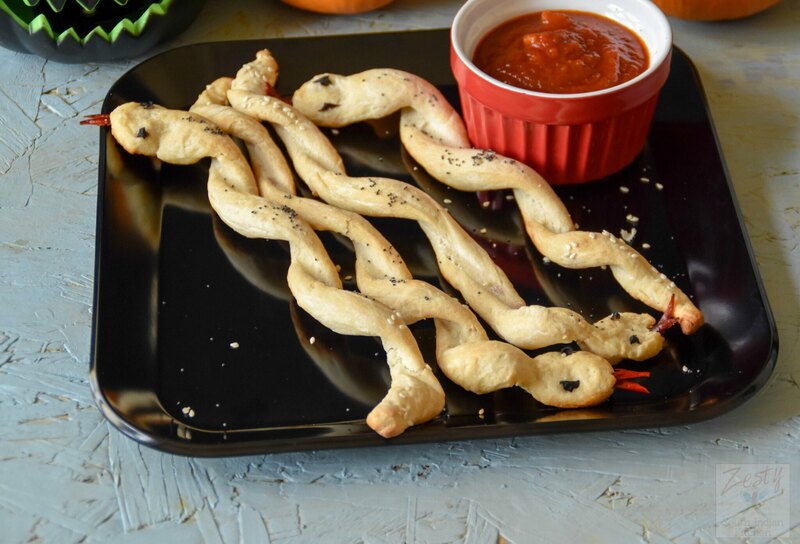 Delicious bread stick snakes great snack go well with marinara sauce. tapering one end (for tail) and flattening the other end (for head). Wrap each rope in a spiral around a greased 10 ½-inch chopstick brushed with olive oil. Brush with olive oil and sprinkle body with poppy seeds and tails with sesame seeds. Cut black olives into small triangles and place on the head of each snake to make the eyes. Bake on two parchment paper-lined baking sheets at 350°F until golden brown, 11-15 minutes. Cool 3 minutes , before carefully removing chopsticks. While still warm, use a toothpick or knife tip to carefully thread dried chiles (cut into tongues) into the tip of the flat end of each snake to make the tongue. I love the snake breadsticks! I will definitely tuck this away to remember for next year! 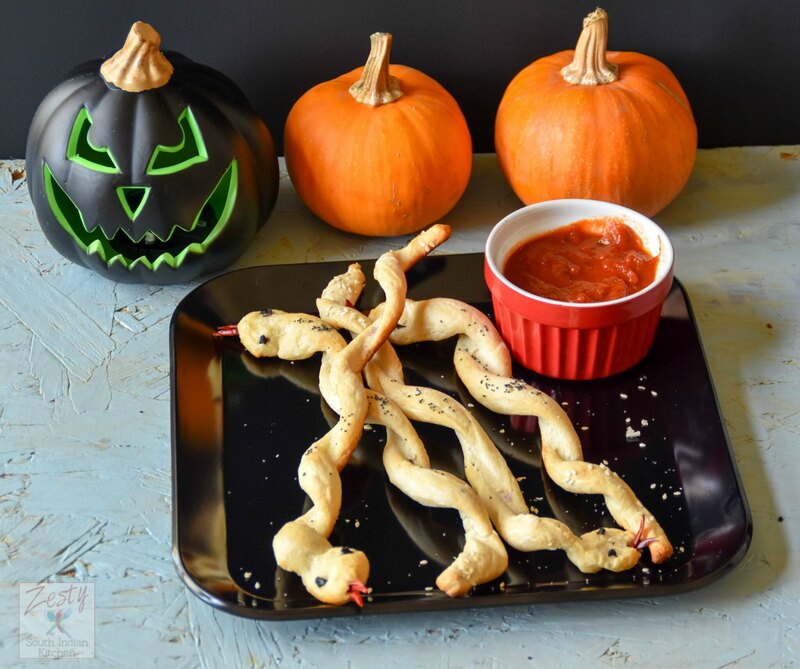 Bread stick snakes, they sort of look scary and cute at the same time, nice idea Swathi..
Great idea for kids at Halloween time. 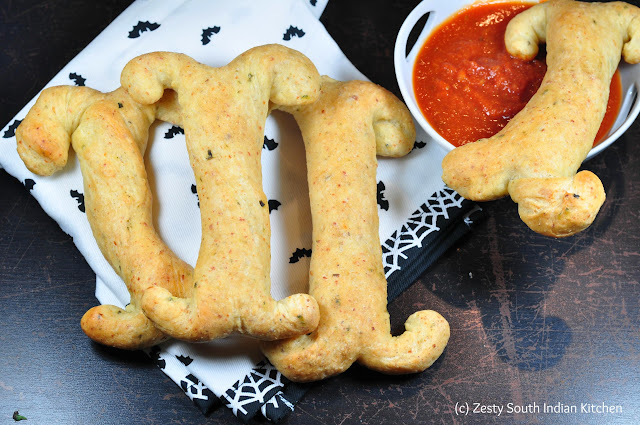 Mine would love them w/garlic and tomato sauce. Yes they will be delicious with garlic tomato sauce. 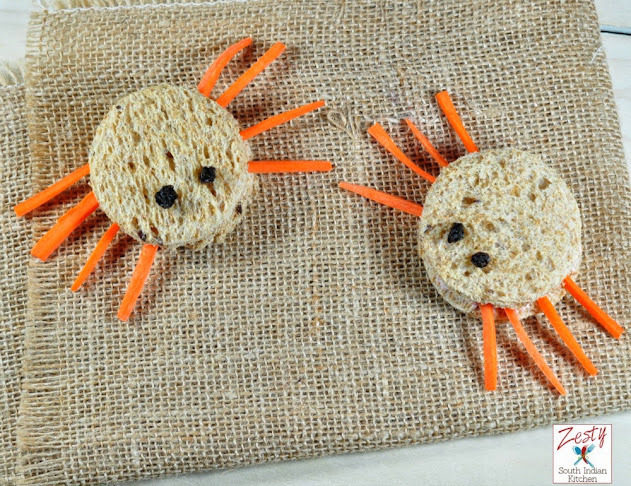 These snakes are so cute and the kids will love this for sure! I love how you have wrapped them to resemble actual snakes! Super fun idea and I love the other posts your listed showing other holiday ideas for Halloween! Thanks for posting this! Looks fantastic and it sounds like must try! So much better than store-bought treats! Love these! 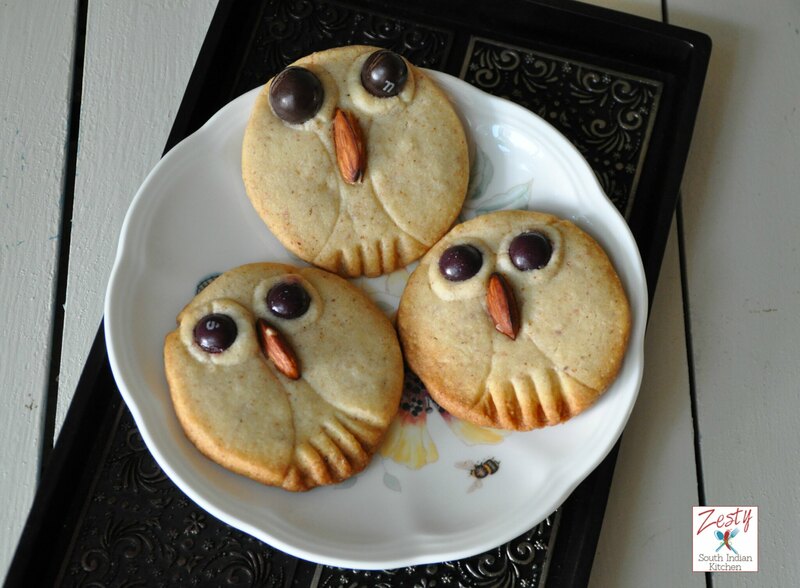 This is such a great idea, and a quick and easy way to do it too using ready made pizza dough. My kids would love this any time of year! Yes I tried with homemade dough that doesn’t work. I love these bread snakes. They are super cute. I am sure my grandkids would love these!!! Thanks Dawn yes they are cute kids love it. Looks so good and scary.